Bulk Add/Edit Field Choices. Add, Edit, and rearrange the field options in radio, check box, and drop-down select fields. Click "Bulk Edit Field Choices", select predefined choices or copy and paste your own choices, and click the "Update Field Choices" button when complete. CSV Entry Import. Export or create a custom CSV file and then import entries into your forms. See the Knowledge Base for instructions. Custom Display "Insert Position." Some themes do not load the automatic custom displays correctly. This happens when the theme tricks Formidable into believing the custom display has already been loaded. If your custom display settings don't show up on your page when they should, try increasing the "insert position" in the top right box in the custom display settings. This addition will prevent the custom display from being loaded multiple times per page, but will allow users to set when it shows up. Improved frm-stats shortcode. Added functionality to frm-stats shortcode to accept "where" options in key/id=value pairs. 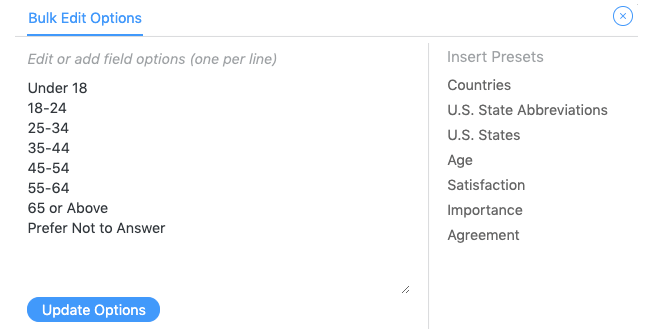 This addition will allow you to only count entries toward your statistic when the value in another field in the form is what you insert. For example, [ frm-stats id=x 25=Hello ] where 25 is the field ID of the other field in the form and "Hello" is the value that field should have in order to be applied toward the statistic. Added Options on the Formidable Settings page. Option to turn off HTML5 use in front-end forms. If you want your forms to validate but your theme isn't using HTML5 you can turn it off. Option to turn off user tracking. If you are seeing the "Headers already sent" error, turn this off. CSV export format option. If your CSV exports are replacing your characters with random symbols, try changing this option. Custom displays and post taxonomy enhancements. When using forms to create and edit posts, you are likely to include tags or categories. In custom displays, these will be automatically changed to links like they are in most blogs. You can see an example of this in the help desk (tags, status, and categories). Using taxonomies in the "where" options in custom displays now works with [get param=tag]. For example, the help desk is using this option for the tags, status, and category fields. For the URL https://formidableforms.com/topic-tags/registration/, the where row that is limiting the displayed entries is set to "Tags is equal to [get param=topic-tags]". Although topic-tags isn't a GET parameter (like in example.com?topic-tags=registration), Formidable now checks the wp_query global as well when using the [get param=whatever] shortcode. Unique Time. If your form includes both a date and time field, checking the box to set your time field to "Unique" will do extra special things now. When a date is selected, any times that have been selected for that date will be removed from the time options. If one user selects July 14th at 5:00, when another user selects July 14th, 5:00 will not be an option in the drop-down. This is a small step towards better booking forms. Added [ frm-entry-update-field ] shortcode. The frm-entry-update-field shortcode allows updating of a single field in an entry with an ajax link. For more details, see "single field" at the bottom of this post. To upgrade, visit the plugins page in your WordPress admin or follow the manual install instructions. I just “pressure tested” the bulk entry function of the newest release by copy-pasting a list of 444 entries with various hyphenations and punctuation characters. Everything came in just fine, and took about 2 seconds. Awesome!!! There still seems to be a minor glitch with the blue Field Options not always (sometimes it does) expanding/collapsing until the form is updated. Also, the preview list doesn’t update until the form is updated. Both minor issue to me, but worth noting I suppose. The only REAL item for me: Long lists still chew up a lot of real estate. It would be really nice to have any list over X items (10, 20, ???) appear in a scrollable pane – especially since those values are only for visual reference anyway (i.e. not directly editable). Thank you so much for the excellent form and willingness to accommodate your client requests. Frankly $97 is a LOT of money for a WordPress plug-in, and I’ve never even come close to paying that much before. But for anyone who has serious form requirements on WordPress websites, your solution and customer service are worth every penny!!! I would like to say that Formidable has become a very powerful/useful tool for my workplace. Most of all, I would like to say kudos to Stephanie and everyone working on Formidable. I appreciate the quick response time that Stephanie gives and really like the fact that they address most/all issues by way of fixes or add-ons to the plugin. I work at a library so forms are an important process of our daily routines and Formidable just makes us more efficient and provides great tracking of stats. I recommend Formidable for anyone looking to build custom online forms. Keep up the good work and I look forward to using Formidable everywhere I can. Great job! Your hard work is much appreciated, your WordPress forms plugin gets better and better every month.